NNC-8 Nutrition Officer III Niño Archie S. Labordo briefs HIMSoG-8 members how they can help boost the nutrition office’s webpage during the group’s 1st quarter meeting on February 22, 2019 at NNC-8 region office. TACLOBAN CITY – Help the National Nutrition Council Region 8 (NNC-8) boost its webpage by contributing more nutrition-related articles, feature stories and pictures, net-engaging, liking, sharing and tagging, and inviting researchers to hunt nutrition information on the webpage. 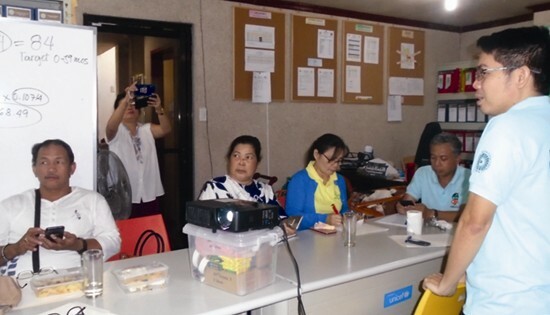 This was the consensus of the Harmonized Initiatives of Media for the Spread of Good Nutrition in Region 8 (HIMSoG-8), a NNC-8 media-group partner, after a brief Social Media Enhancement Workshop conducted during its 1st quarter meeting held at NNC-8 office on February 22, 2019. Instead of launching its own social-media engagement on “Winning the 2019 Election in Nutrition through SocMed” as previously planned, workshop resource speaker and HIMSoG-8 member Sarwell Meniano suggested to strengthen in its place the already existing NNC-8 webpage. Niño Archie S. Labordo, NNC-8 Nutrition Officer III, said while in the past years the NNC-8 webpage was fifth from the bottom – as compared to similar webpages of nutrition offices of other regions, last year (2018) Eastern Visayas was already in the middle of the hierarchy based on internet analytics, with Region 7 (Cebu) and Regions 1 and 2 on the lead. “There is a big change to catch up with them, to date if there is a most improved webpage it is NNC Region 8,” Labordo said, as he invited everybody to actively contribute accurate and relevant articles. In this connection the nutrition regional office here provided the HIMSoG-8 membership with the latest Operation Timbang Plus 2018 results of 0-59 and 0-71 month old children per municipality, city, and province in Eastern Visayas categorized weight for age, height for age, weight for length/height and summary, and probable topics/subjects to write which are national-focus of the month, for example for March – Rabies Awareness Month, International Women’s Month, International Women’s Day, and World TB Day that could be given slant related with nutrition.